Michelin and 17 points Gault-Millau and I am sure it is only a matter of time until he receives his 18th point from Gault-Millau. Reto Lampart has been working constantly on his cuisine, classical French Mediterranean inspired, to reach today’s high standard. My resp. our family’s relationship with Lampart’s goes a long way back. When Reto Lampart opened his restaurant together with his then girlfriend and now wife Anni – originally named Lampart’s Art of Dining – in 2000, my husband and I as foodies were fast to try out this new culinary hot spot and became soon fans of his elaborate cuisine. Two years later we even celebrated a special birthday with a party of more than twenty people at this restaurant. 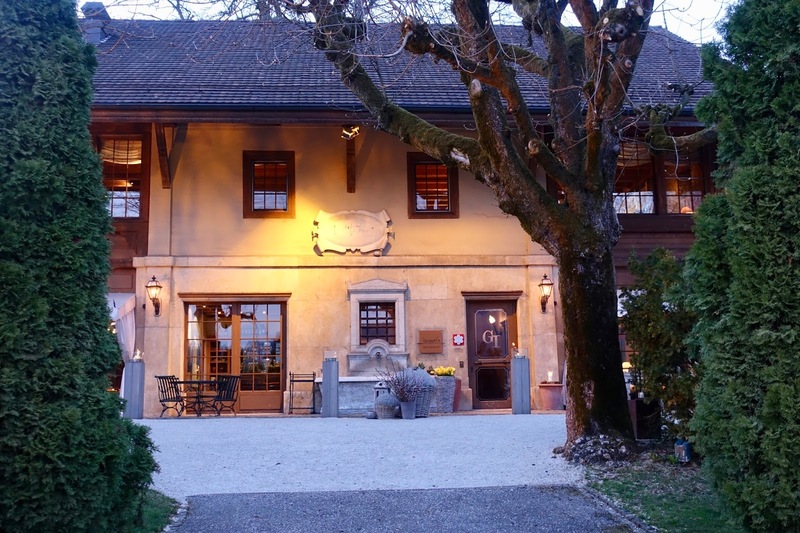 In 2003, Reto Lampart bought the place and another year later he was awarded his second star Michelin. The restaurant is housed in a historical carriage house from 1840, beautifully renovated in the English country house style. You feel enchanted going up the gravel way and getting closer to the building. It is like a throwback to a time long gone by. If only it had not been located next to a busy road in the nondescript village of Haegendorf near Olten. The only advantage of this situation is the fact that it can be reached from Zurich, Basle and Berne in about half an hour by car. It is not only a beauty from the outside but also the interior is a real feast for the eyes. It is tastefully decorated in a timeless, elegant style without giving the impression of being stiff. On the contrary, the ambiance is inviting und you feel comfortable in here. In addition, there is a generous spacing between the tables so you have more privacy and personal space. 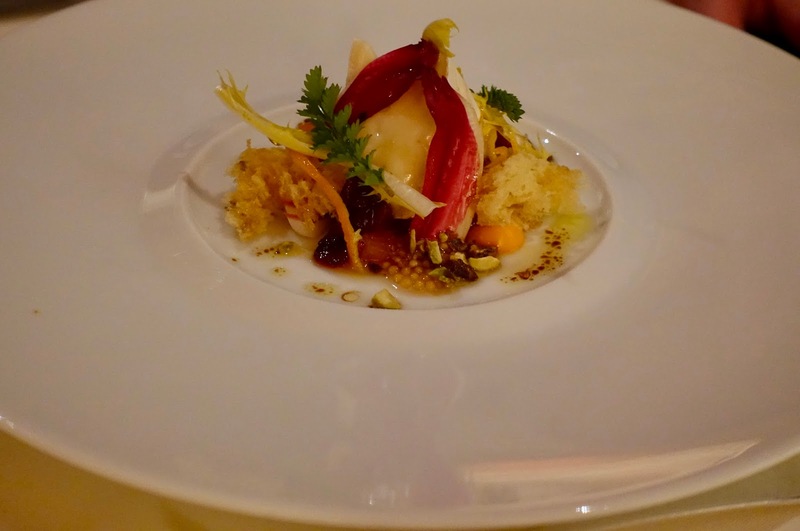 As mentioned above, Reto Lampart celebrates a classical yet modernized French cuisine, with heavy Mediterranean influences. His cooking has substance, without the chichi often associated with haute cuisine. The chef stands out for his meticulous working style. The dishes are expertly crafted and attention is paid to minutest details, however not without some surprise effects once in a while. The size of portions is exactly right, not so tiny that flavors cannot unfold. There are two menus available from which you can choose five courses or more. Alternatively, you can order one or more starters from the menu and combine them with a Lambart’s classic main out of a small selection. Menu “Sinfonie plaisir” with eight courses contains fish, seafood and meat, menu “Sinfonie naturelle” with seven courses has only vegetarian dishes. Our party of four opted for five courses from the “Sinfonie plaisir”. By lucky coincidence, all eight courses were ordered, so we all could at least have a look at them. 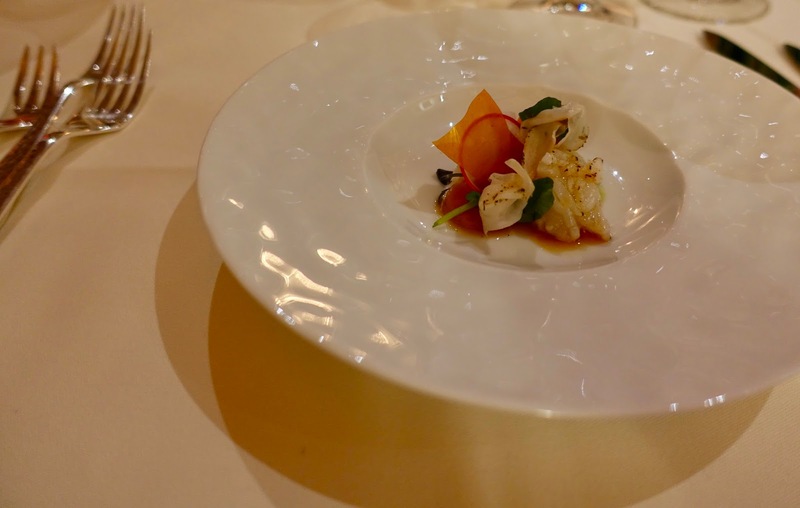 The long awaited gastronomic pleasure started furiously with an outstanding amuse bouche: sublime crab meat with its condiments. The light sauce that came with the seafood made it a superb combination. We were a bit surprised that we got a meat dish as first course, but the lamb together with the greens and the cheese blended magnificently. The dried egg yolk finally was the cherry on the cake. The first fish dish I had was quite an extraordinary one. 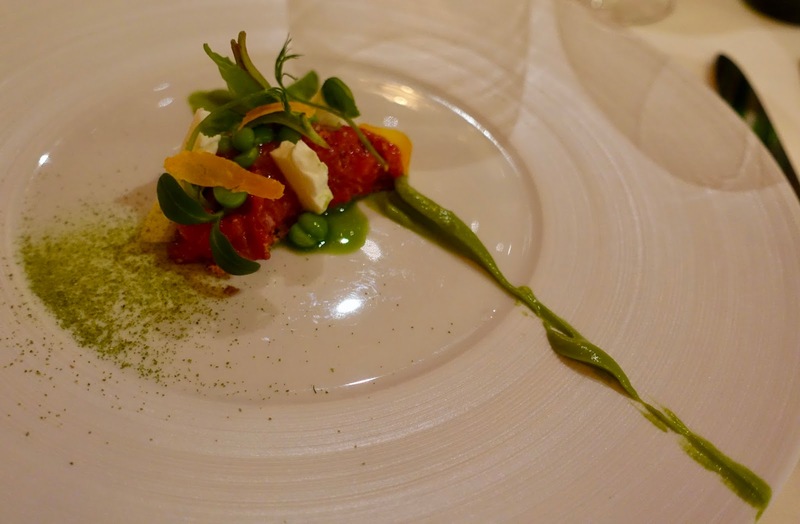 I am lover of ceviche – raw fish cured in citrus juices –, however escabeche is different. It is seared fish, marinated in a vinegary sauce, loaded with herbs and spices and served at room temperature. 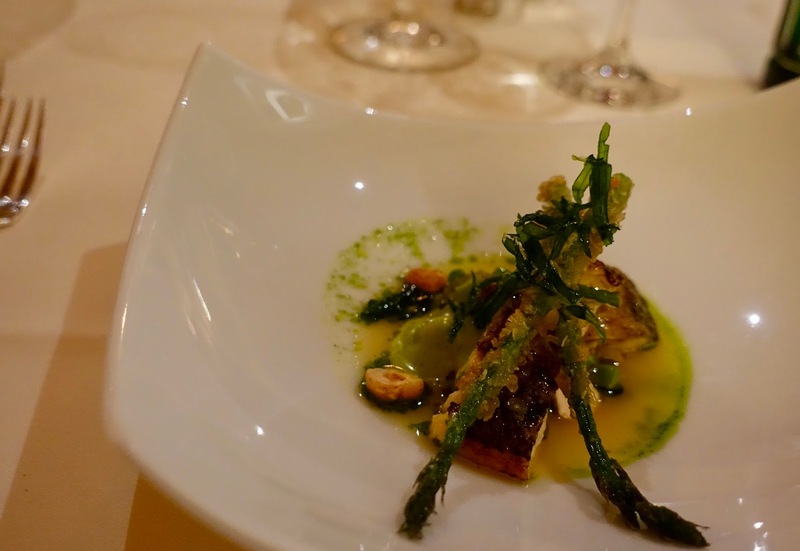 The chef prepared it impeccably complemented with asparagus and sticky Asian rice, a new taste sensation. 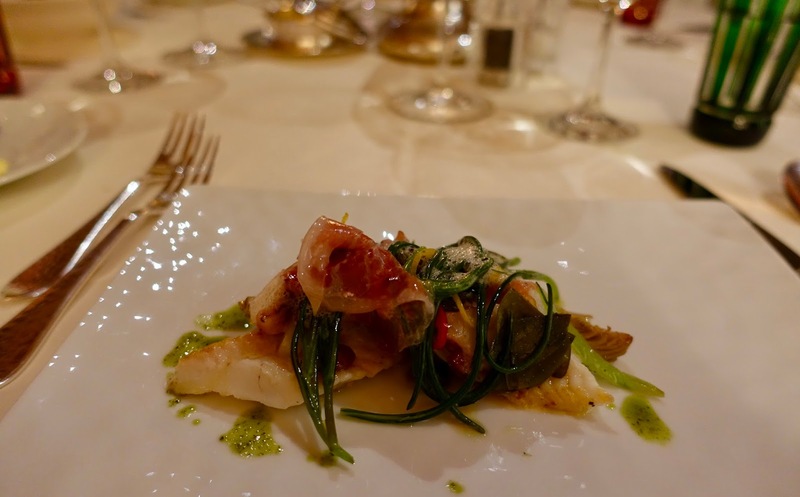 The next starter was a sole fillet, one of my favorite fishes, and squid, prepared in a Mediterranean way. 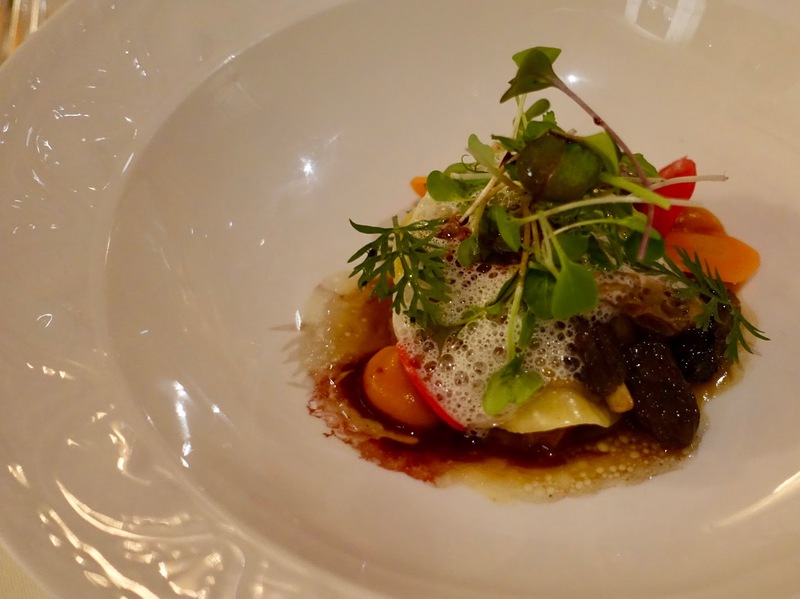 The fish was firm, the seafood tender and together with the vegetables, the herbs and the sauce this course made a tasty creation. And the magic found its continuation in the main course. The four of us had discussed it before the meal. We asked ourselves what kind of piece the veal shoulder tip is and whether it had something to do with Tafelspitz (tip of ox), especially because it was served with horseradish. It turned out to be the highlight of our meal. The meat, cooked sous vide, was succulent, very tender and flavorful. 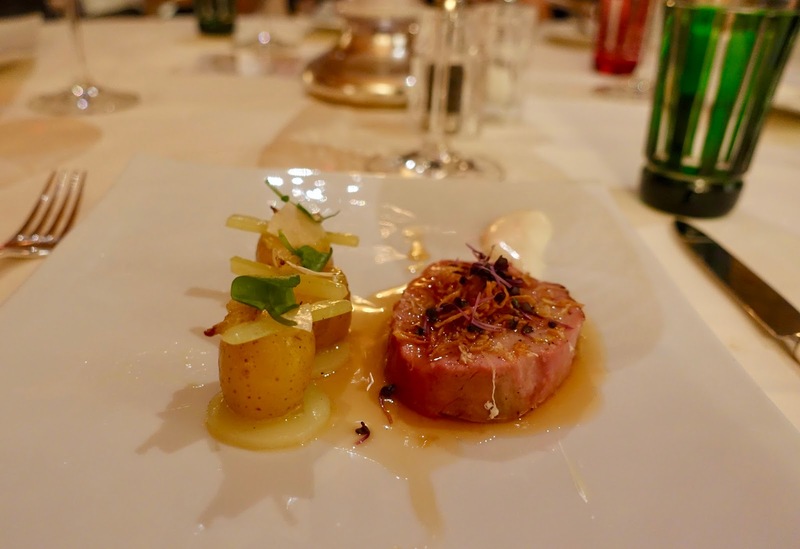 It harmonized perfectly with the light sauce served with the veal and the kohlrabi potato towers were not only a feast for the eyes but also for the palate. My husband was the only one of the table who ordered cheese instead of a dessert and was delighted by the sweet and sour variation of soft cheese, honey sponge and herbs. From looking at it, this course was definitely not your normal cheese dish. 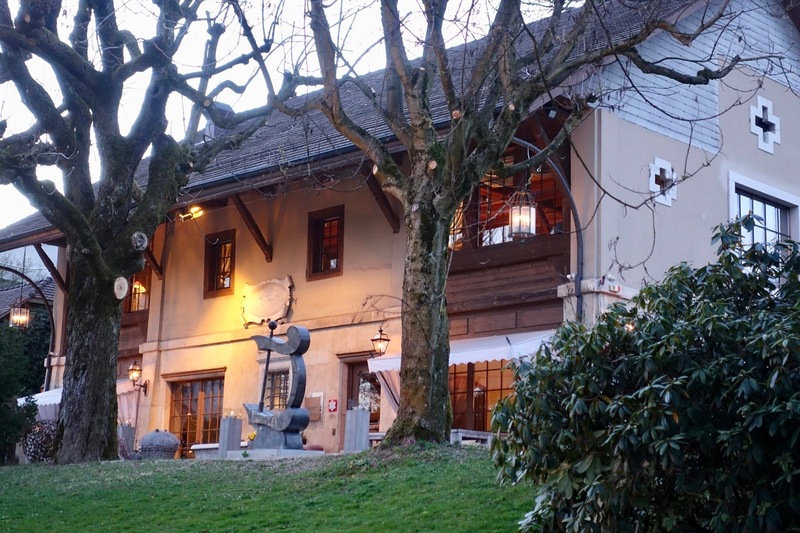 The chef is known for its special cheese courses, an all time favorite certainly is Vacherin cheese and Schlorziflade, a speciality from Appenzell (tart with puree of pears and spices). This is the Swiss canton where the chef comes from. If you have a chance to try this, do not hesitate, it is really one of a kind! This was my choice of a dessert and I was happy to have opted for it. 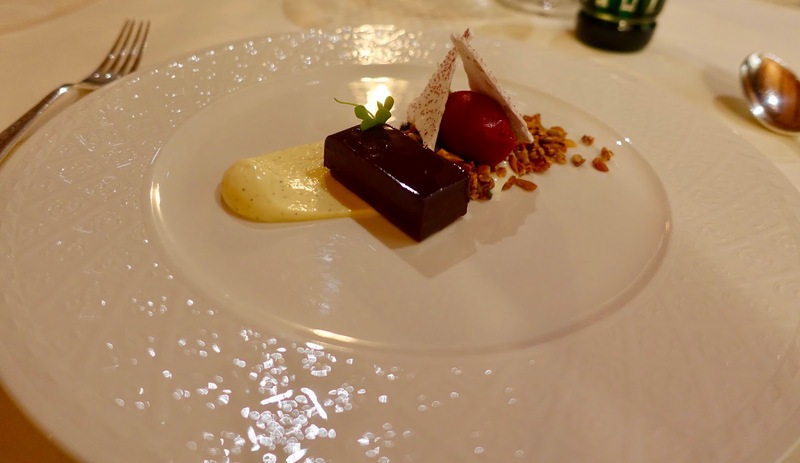 The other dessert was also promising, but I cannot refrain from having chocolate when it is on the menu. And it was totally worth it, the chocolate was like a big fondant praline. It was tenderly melting and suited perfectly to the accompanying cream. The raspberry ice cream, the granola and the white baiser with red dots made it complete, a divine combination of flavors and textures! The fruity dessert was the choice of a fellow diner, so I could only admire the beautiful arrangement but not taste it. 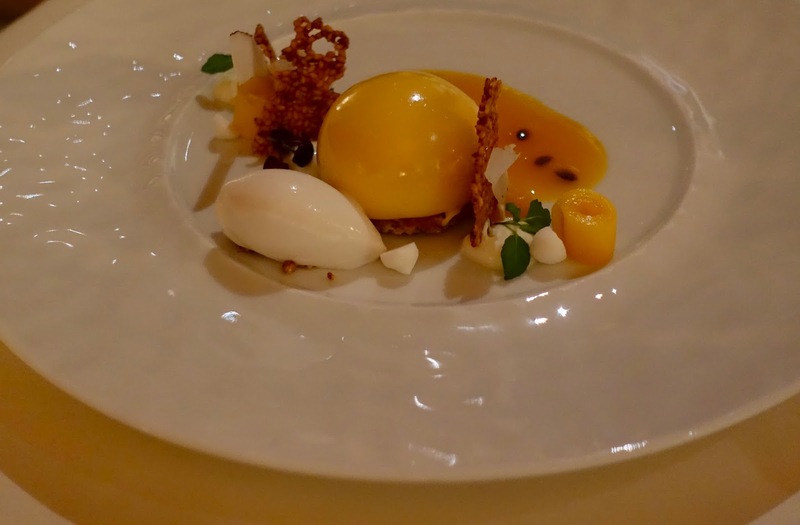 The mango cream on caramelized sesame, accompanied with passion fruit sauce and coconut ice cream was a beautiful composition indeed. After everyone except my husband had relished the sweet dish, we were treated to a bonus pastry. 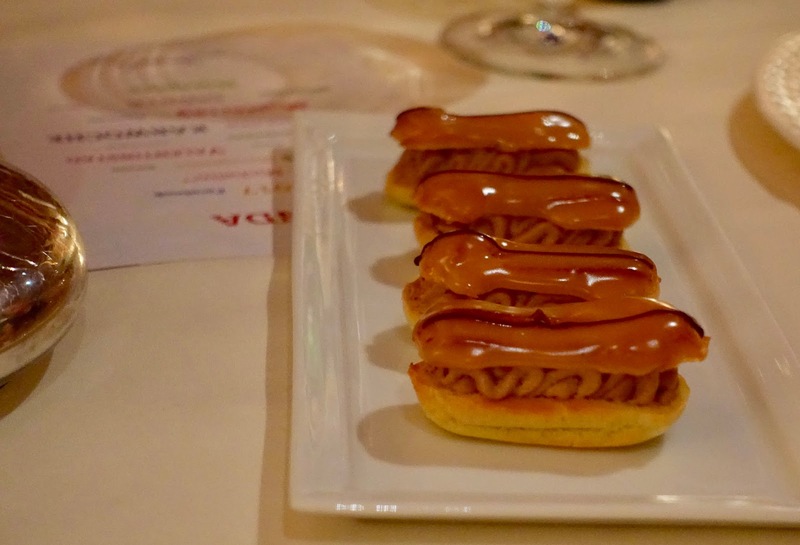 It was a coffee eclair, made with crisp dough, filled with a delicate cream and topped with icing, heavenly! it was not quite the end! 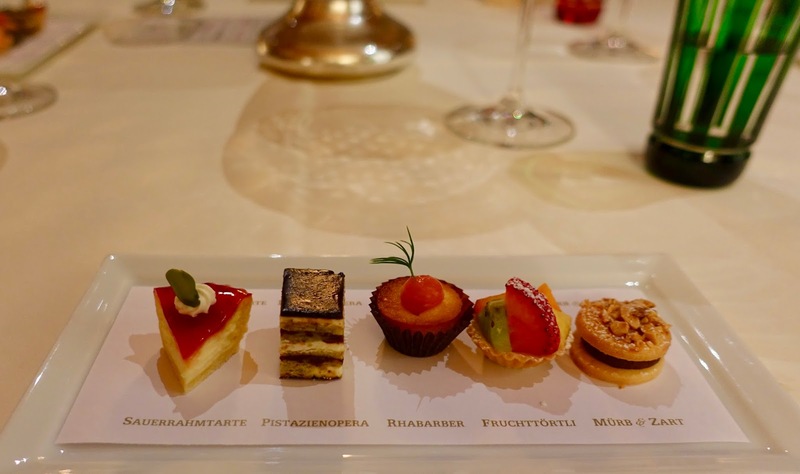 The gastronomic explosion was completed with a procession of tiny tarts – one finer than the other – and as a plus there was our choice of a truffle from a special box offered by the staff. 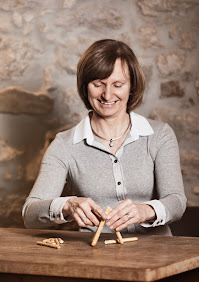 The service under the supervision of Reto Lampart’s wife Anni is top-notch. Its standard does not fail to impress. Compared to the one we experienced some ten years ago, it is more present and more attentive. Staff is warm and competent yet relaxed and unobtrusive. The dishes are served at the right intervals, there are no overlong waits but there is also no rush. That is another point that has been improved, at the time we were faced with long waiting times again and again. When it comes to prices, they have gone up compared to a couple of years ago but so has the level of quality. Given the performance of cuisine and service the price you pay is totally worth it. One has to be aware of the fact that culinary experiences such as the one you get at Lampart’s come at a price. In this context, I was pleasantly surprised that the current menu now can be found on the restaurant’s homepage! Until recently, this was not so and therefore the cause for complaint. 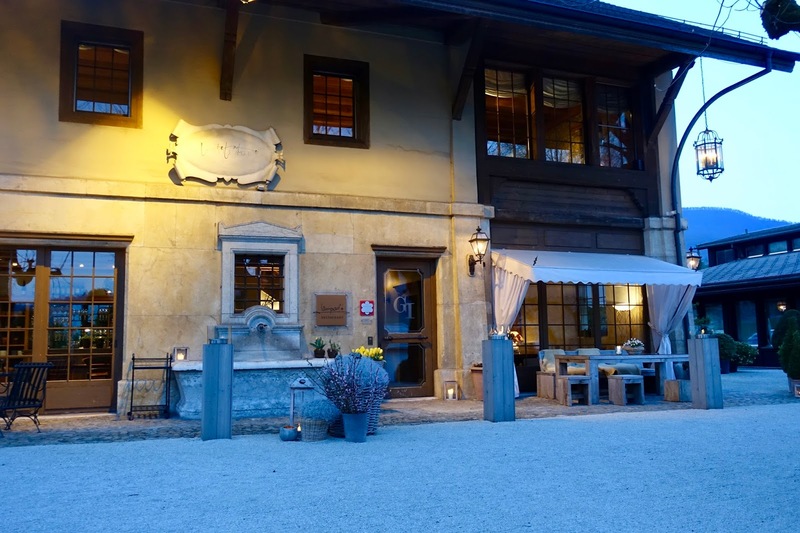 In case you look for a culinary hot spot in the triangle between Zurich, Basle and Berne, there is no way around Lampart’s. Classical French cuisine Mediterranean influenced at its best is offered at this beautiful restaurant in a renovated carriage house. Cuisine and service make sure that even a discerning epicure will be satisfied. The chef is master in his field and his wife ensures a warm hospitality leaving a lasting impression.